3.7 out of 4 stars. A perfect spooky story for this time of year. A great eerie tale that Ruth Ware put together! Lo Blacklock is a journalist who has a life that is not going according to plan. She is in a job that she cannot for the life of her get a promotion in. She has a boyfriend who loves her but is constantly traveling and leaving her by herself. She may also have a drinking problem that she cannot kick. All in all it seems like it is slowly spiraling down. However, it only gets worse when she has a break in within her dump in the wall apartment. She is left unharmed besides a cut on her face but it leaves her quite shaken up. Good news (or what she thinks) finally comes in an assignment to board the Aurora luxury cruise line headed to check out the Northern Lights and write about the experience. Jackpot! The boat only has 10 rooms on the facility so it should be a relaxing, intimate, and overall good experience for Lo after her traumatizing experience. That is until she wakes in the middle of the night to hear a large splash overboard in what could only be assumed to be a body getting taken care of. Yikes! I finished this book in a day and loved how the plot was very original. I honestly had trouble figuring out the killer and for all the suspense I read, I love to still have the ability to be surprised. 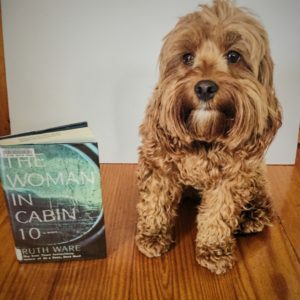 I read Ruth Ware’s New York Times Best Seller, “In a Dark, Dark Wood” last year and I honestly think is better. It is great when you feel like an author is only improving and not giving up after reaching a quick stardom. I am looking forward to see what else Ware has for the future.